Product prices and availability are accurate as of 2019-04-16 23:56:18 EDT and are subject to change. Any price and availability information displayed on http://www.amazon.com/ at the time of purchase will apply to the purchase of this product. Enjoy bright energy-efficient LED lighting in any space with this 4W LED strip lamp. The long arm provides extended reach up to 33 inches, making this an ideal choice for large workspaces. 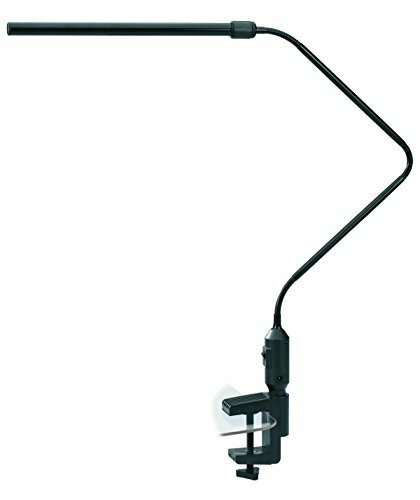 The lamp also includes 3 flexible gooseneck joints which allow for maximum versatility and light placement. The non slip grip clamp has an opening of 2 inches making it adaptable to most desktops, work benches and other horizontal mounting surfaces. The sleek black finish will complement any decor. This lamp is ETL listed. Includes a manufacturer's 90 day limited warranty.